Once again, David and Cynthia Enns have looked to their former careers in finance when naming Laughing Stock’s first Port-style wine. Canadian wineries no longer use European wine nomenclature. This fortified wine is called Dark Pool, and only those knowledgeable about high finance know what that means. David and Cynthia explain in a covering letter with the wine. “One of the most secretive practices on Wall Street is the use of dark pools, which are off-exchange platforms that let traders buy and sell stocks anonymously,” they write. They say that this “under the radar” practice is growing quietly. It is probably not a healthy practice for the public market but, since Bernie Sanders won’t be the next president, I can’t see who will shut it down. In David’s defense, he made 2,450 cases of the winery’s flagship wine and sells it at $45 (plus tax). That provides a good return and, given the quality of the wine, a satisfying experience for consumers. The wine is Portfolio, the initial example of the couple using a financial term. This award winner is a favourite among wine collectors because it can be aged at least 10 years. I was able to taste a vertical last year and every vintage was drinking well except for 2003, the first Portfolio. Here are notes on the wines. Price do not include tax. Laughing Stock Amphora Viognier Roussanne 2015 ($20.99 for 167 cases of 500 ml bottle. Available only at the winery, this artisanal wine is made by fermented whole bunches of grapes in two clay amphorae with native yeast. This is the third year in which the winery has made a wine in this style. It has begun to acquire a following. The wine was left on the skins for 5.5 months, compared with 2.5 months in 2014 and just five weeks in 2013. The 2015 is a richly-flavoured wine with honeyed aromas of apricots and orange peel that are echoed in the flavour. The finish is dry. Food pairing? I recommend hard Italian cheese. 91. Laughing Stock Portfolio 2014 ($44.99 for 2,450 cases). This is 49% Merlot, 28% Cabernet Sauvignon, 20% Cabernet Franc, 2% Malbec and 1% Merlot. The wine was aged 19 months in French oak barrels (40% new, 60% second fill). It is a big, robust wine (14.9% alcohol), reflecting the excellent, if hot, 2014 vintage. It begins with aromas of cherry, blackberry and spice, leading to flavours of black cherry, red and black currants and mulberries. The finish is marked with savoury and spice notes. 94. Laughing Stock Dark Pool 2010 ($34.99 for 179 cases of 500 ml bottles). This is a fortified Merlot that aged five years and eight months in 500-litre oak puncheons. In the old days before wineries stopped using European nomenclature, this would have been called Port. Dark in colour, it has aromas of fig, stewed cherries, chocolate and oak leading to flavours of figs, dates and prunes with spicy oak on a fruity finish. 91. One of the most frequent questions I get is which is my favourite winery in B.C. It is difficult to answer that. Virtually every winery has appealing strengths and I can recite them until your eyes glaze over. However, family-owned Wild Goose Vineyards has always been in the top 10 of my favourites. The wines are reliable and affordingly priced. Even more important, the Kruger family which owns the winery, is among the most pleasant families in the B.C. wine industry. It would surprise me if anybody ever had in a bad experience during a visit here. For a bit of background, let me quote the profile from John Schreiner’s Okanagan Wine Tour Guide. in Germany in 1931, built a family legacy on this four-hectare (10-acre) Okanagan Falls property that he bought as raw land in 1983. With sons Hagen and Roland, he planted Riesling and Gewürztraminer, now the signature varieties for Wild Goose. Hagen, (left) born in 1960, became the winemaker and viticulturist. In turn, one of his sons, Nikolas (born in 1985) also became a winemaker, studying at Okanagan College and gaining practical experience at Tinhorn Creek, Hester Creek and at Bremerton Wines, a family-owned Australian winery. Hagen’s other son, Alexander, has taken up viticulture. Roland Kruger, (right) who handles marketing at Wild Goose, lives on the winery’s two- hectare (five-acre) Mystic River Vineyard near Oliver. Purchased in 1999 to support the growing demand for Wild Goose wines, it grows Pinot Blanc, Pinot Gris and, of course, Gewürztraminer. In 2008, the Krugers planted more Riesling and Gewürztraminer but just small blocks of Merlot and Petit Verdot, on their newest property, the 3.8-hectare (9.5-acre) Secrest Vineyard just north of Oliver. “We decided to stick with what we do best,” Roland explained. The spacious wine shop replacing notoriously cozy quarters gives visitors room to move about, or space to relax on a deck overlooking the vineyards. However, Wild Goose retains its warm family welcome because the tasting room is managed either by a Kruger or by staff imbued with the Kruger culture. In 2015, after that book came out, the winery won its eighth Lieutenant Governor’s Award for a 2014 Gewürztraminer from the Mystic River vineyard. Here are notes on some of the wines that may still be available at the winery or in the market. Wild Goose Autumn Gold 2015 ($16.52 for 5,000 cases). In spite of the astounding volume, this very popular wine is sold out. The blend is 34% Riesling and 33% each of Gewürztraminer and Pinot Blanc. It begins with an herbal and spicy aroma, going on to flavours of herbs and grapefruit. Sweet reserve was added to the wine after fermentation, yielding residual sugar of 34 grams per litre. Yet the wine is so well balanced that it seems dry, with a lingering hint of ginger on the finish. 90. Wild Goose Gewürztraminer 2015 ($17.05 for 850 cases). This is a wine with a clear varietal signature, beginning with spicy and floral notes on the nose. It has intense flavours of lychee, with a hint of ginger. It is balanced to finish dry with just a hint of residual sugar. 90. Wild Goose Mystic River Vineyards Pinot Blanc 2015 ($16.62 for 550 cases; sold out). Twenty percent of this wine was fermented in new French oak. The wine has appealing aromas of apple, melon and vanilla. On the palate, it is a bowl of fruit – apple and pear with a hint of cantaloupe. A touch of residual sugar adds to the fleshy texture. The finish is refreshing. It also lingers. 91. Wild Goose Riesling 2015 ($16.52 for 1,1oo cases). This begins with citrus aromas and a hint of petrol that will develop with age (as if this wine will be around long enough to be aged). It has flavours of lemon and grapefruit with a touch of residual sweetness to pop the taste. The mineral backbone – some of the fruit is from 32-year-old vines – and the brisk acidity give the wine a dry finish. 91. Wild Goose God’s Mountain Riesling 2015 ($17.39 for 300 cases). This wine is made with grapes from a legendary low-yielding vineyard on a clay bluff on the east side of Skaha Lake. The racy acidity and the mineral backbone add to the crispness of the wine. It begins with citrus aromas, leading to a core of lemon flavours that have a lingering finish. 92. Wild Goose Merlot 2013 ($17.39 f0r 600 cases). The wine, which was aged 12 months in French and American oak, has aromas of black cherry, plum and vanilla. The flavours of plum and black current mingle with earth and smoky notes. The tannins are ripe but firm. 88. This year, I have been struck by the number of wineries that are celebrating anniversaries of 20 or 25 years. Tinhorn Creek Vineyards planted much of its vines in 1993 and opened the winery in 1995, putting in the middle of anniversary dates. It is, however, one of the senior wineries in the business. That longevity is positive for several reasons. First, it shows that the British Columbia wine industry is solidly successful, and not just for wine but for leading edge practices. Secondly, it means wines are being made with grapes from mature vines which just deliver more flavour. The four wines reviewed here are from 17 or 18-year-old vines. Regarding being on the leading edge, Tinhorn Creek was the first Okanagan winery to achieve a carbon neutral status. We’re not just smart, we’re Climate Smart. In 2007, Climate Smart and other programs like it came on the global scene as a tool to teach businesses about measuring, reducing, and offsetting their corporate carbon footprint. This is what’s so smart about it: the measuring. It’s challenging to know if what we’re doing is effective…if we don’t measure our process before, during, and after. Climate Smart gives us the tools to identify our contribution to the carbon problem; better yet, they show businesses like us how to reduce that footprint and what we can do to help offset it. We calculate greenhouse gas emissions produced by the winery as a whole, not just parts of it. Then, we target areas to cut emissions – with the goal of being 100% carbon neutral. Where we can’t avoid using energy or generating some waste, we do as many beneficial things as we can, where we can. The result: Canada’s first carbon-neutral winery. Now it’s time to go a step further. Our farm truck and tractors run on biodiesel. In fact, we were so early on this one that we couldn’t find a regular supplier. So we installed a holding tank at our Diamondback vineyard. There still aren’t many of us operating with biodiesel, but we hope that will change soon. Our compost pile has increased while our landfill trips have decreased. This might not seem exciting to many people, but it gets us going. The bigger – and healthier – our compost pile, the more nutrients we have to feed our vines and the fewer items heading to the landfill. In fact, our compost area is part of our vineyard tours. 85% of our bottles are lightweight glass. This is a huge percentage for a winery making 35,000 cases each year. Between the locally sourced bottles (within 400kms, approximately) and the reduced weight, we use less fuel to get the wine into the bottle and onto your table. As a business, we need to get the word out on what we’re selling. It’s the way we survive. Traditionally, tourism and sales based companies often use media to help generate traction in print, and online. One of the biggest challenges with spreading the word about our product is that it needs to be tasted and experienced. Instead of always travelling to media – or bringing them to our winery – we started host web-tastings rather than rack up mileage. We’re still developing this, and measuring its efficiency. We’ll continue to measure ourselves and target more areas to cut emissions. If you have a suggestion for us, we’d love to hear it: send us an email. Here are notes on the wines. Prices do not include tax. Tinhorn Creek Chardonnay 2015 ($19.49 for 1,866 cases). This is as seductive a Chardonnay as I have tasted in a while. The wine was carefully assembled from early harvest and later harvest grapes. The former was fermented in stainless steel with cultured yeast. The later harvested fruit was fermented in barrel with wild yeast and also allowed to go through malolactic fermentation. The result is a wine brimming with citrus and tropical fruit flavours with a touch of vanilla and biscotti. It has a long sensual finish. 92. Tinhorn Creek Cabernet Franc 2014 ($21.99 for 3,916 cases). This bold, ripe red reflects the great 2014 Okanagan vintage. These grapes were fermented slowly with a combination of wild and cultured yeast and then aged 14 to 16 months in barrel. The wine begins with aromas of herbs and cranberries leading to brambly and cherry flavours mingled with vanilla and cedar on the finish. 90. Tinhorn Creek Oldfield Series Merlot 2013 ($26.99 for 2,076 cases). This is 95% Merlot, 4% Cabernet Franc and 1% Syrah. The wine aged in French oak (30% new) for 18 months and then another year in bottle before release. Dark in colour, it begins with aromas of black currants, plum, black cherries and spice. That is echoed on the palate, along with flavours of espresso and dark chocolate. Tasted the second day, the wine also revealed flavours of plum jam. Decant the wine for immediate drinking. 91. Tinhorn Creek Oldfield Series 2Bench Red 2013 ($30.49 for 1,684 cases). This wine is structured to cellar 10 or 15 years, so it needs to be decanted for current consumption. It begins with aromas of black currants, mint, herbs and cigar box. With breathing, the wine shows blueberry aromas as well. This is all echoed on the palate, along with notes of dark chocolate and black olive. The wine also aged 18 months in French oak barrels (30% new) and a year in bottle before release. There is a lot of upside here for those prepared to cellar the wine. 92-94. The virtual winery model has been somewhat controversial in the British Columbia wine industry, although the model is widely accepted around the world. The model has aspiring winemakers making their wines (or having them made) in a licensed winery with custom crush facilities. It is a way to get into wine production without sinking substantial capital into a vineyard and a winery immediately. He made his first commercial wine in the 2010 vintage, using custom crush facilities of an Okanagan Falls winery. He was able to get his toe in the water, so to speak, without giving up his other professional career. By using a custom crush winery and mentoring with a winemaker, Rob could start with limited resources and build the brand. The stable need to have the concrete floor reinforced substantially since wine tanks are heavier than horses. It was also modified to accommodate production facilities, a laboratory and offices. However, hardware for the stalls has been retained, adding character to the winery. The pasture and its riding ring have become a 5 1/2-acre vineyard. Rob planted two acres of Chardonnay and an acre of Pinot Noir in 2014, followed by two acres of Siegerrebe and half an acre of Ortega in 2015. He has continued to buy grapes, both because his vineyard is young and because his top selling wines require Bordeaux varieties not grown on his cool East Kelowna property. “I leased a 2 ½ acre vineyard in Naramata, a Merlot vineyard,” Rob says. It produced enough fruit in 2014 that he was able to add a Merlot to his portfolio, supplementing his successful Bordeaux blend that he calls The Pull. “The demand for The Pull was quite exceptional, so we doubled production in 2014,” he says. The growth of the brand shows his prudence at entering the market by way of the virtual winery route. Rob is equally as enthusiastic about his Chardonnay and his Pinot Noir, the two Burgundian varietals in the portfolio. In 2014, he made about 90 cases of Pinot Noir, with fruit from a Peachland vineyard. Next year, he will release a very good 2015 Pinot Noir with grapes purchased from the Canyonview Vineyard in Summerland. In the longer term, he looks to his own vineyard’s Pinot Noir to come on stream. He was counting on his own vines for Pinot Noir and Chardonnay in 2016 but, in their first harvest, the vines did not deliver the desired intensity of flavours. “Based on flower set from this year, though, I know we will get a sizeable harvest in 2017,” Rob says. Here on notes on some wines in the Nagging Doubt portfolio. Nagging Doubt Chardonnay 2015 ($19.50 for 164 cases and 22 kegs). This is a crisp and dry wine with vivid aromas and flavours of citrus and with very subtle oak in the background. 90. Nagging Doubt Pinot Noir 2015 (To be released in 2016). These notes are from tasting a barrel sample. The wine will be bottle early in the new year. Rob started fermenting the grapes with wild yeast, adding cultured Burgundy yeast half way through. He was able to achieve the legendary “forest floor” aromas and flavours of Burgundy, along with intense flavours of cherries. 92. 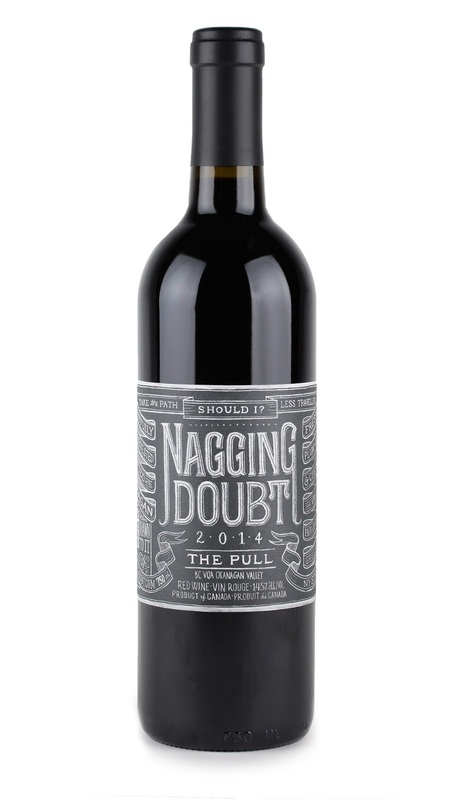 Nagging Doubt The Pull 2014 ($29.90 for 392 cases). The blend is 40% Merlot, 28% Cabernet Sauvignon, 17% Petit Verdot, 8% Cabernet Franc and 7% Malbec. The wine has had 18 months in French oak. It has bold aromas of black cherry and vanilla with a floral perfume. On the palate there are flavours of plum, black cherry and espresso. The tannins are ripe but with enough grip to mature elegantly for 10 years. 92. The three reds released this fall by Stag’s Hollow Winery at Okanagan Falls include a Dolcetto. That wine coincides with the release of a Dolcetto from Moon Curser Vineyards of Osoyoos. This is great news for lovers of this varietal, usually identified with producers in Piemonte in Italy. Larry Gerelus and Linda Pruegger, owners of the winery, have a block of this variety in their Shuttleworth Creek vineyard just south of Okanagan Falls. The two Dolcetto wines send me look up Dolcetto in Grape Vines, the marvellous resource from Jancis Robinson (with two colleagues). The book reports that the grape was first mentioned in 1593. They write that there are scattered plantings of the variety in California, Washington State, Oregon and even Texas. These two British Columbia producers planted Dolcetto after the book was written. The wines fit the book’s descriptors, although they differ from each other somewhat. The Moon Curser wine is leaner in texture than the Stag’s Hollow wine. I expect that reflects the differing soils in which the vines grow. The Osoyoos East Bench soils would be sandier than the Okanagan Falls soils. I reviewed the Moon Curser Dolcetto 2015 ($26.90) in a recent blog. This is an unoaked red which suits the soft and juicy texture. The wine has luscious aromas and flavours of cherries, finishing with a fruit sweetness at the end. Of course, it is a dry wine. The Stag’s Hollow trio also includes a Grenache. This is a late ripening variety not widely grown in the Okanagan. The grapes for this come from a vineyard on the West Bench in Penticton and East Bench in Osoyoos. The variety has been championed since the 2012 vintage by Dwight Sick, the winemaker at Stag’s Hollow, who likes to release the wine for International Grenache Day, September 16. Here are notes on the three Stag’s Hollow releases. Stag’s Hollow Dolcetto 2015 ($21.99). Sixty percent of this wine was aged five months in 300 litre French oak (third fill) while the remainder was aged in stainless steel. The wine begins with aromas of plum, black cherry, chocolate and a hint of tarragon. Fleshy in texture, it coats the palate with luscious cherry and plum flavours. Indeed, there is a touch of liquorice on the finish. 90-92. Stag’s Hollow Grenache 2015 ($25.99). There is 12% Syrah in this bold, brawling red with 15% alcohol. It begins with aromas of cherry and vanilla with a hint of pepper. On the palate, it has savoury, meaty flavours of cherry and blueberry with vanilla and pepper on the powerful finish. 92. Stag’s Hollow Heritage Block 2013 ($21.99). This is 50% Merlot, 26.5% Cabernet Sauvignon, 11.5% Cabernet Franc, 10.5% Malbec and 1.5% Petit Verdot. The wine begins with appealing aromas of black cherry, plum, chocolate and cedar. It has a generous texture, with flavours of cherry, chocolate, leather and toasty oak (from having aged in barrel 18 months). It is astonishingly good value. 92. In June, I spent an interesting morning at 40 Knots Vineyard & Estate Winery, tasting the wines with owners Brenda Hetman-Craig and here husband, Layne Craig. Then an avalanche of work intervened. By the time I got back to my notes, I discovered that most of the wines were sold out. It is now academic that I scored most the wines 90 or higher. It is no wonder that this Comox winery has some bare shelves at end of summer. Consumers found the wines without my help! What is notable about the success is this: the original owner of 40 Knots, Bill Hamilton, also had good wines on the tasting room shelf when he opened in 2013. But he was overwhelmed both by the demands of the 18-acre vineyard and the challenge of gaining traction in the market. Brenda and Layne, on the other hand, are almost a generation younger, with a commensurate energy level. They came to wine by a circuitous route. Layne grew up in Midale, a small farming and old-producing town in southeastern Saskatchewan. He tried to join the military after high school. “They were not going accept me to fly fast planes because I wear glasses,” he recalls. So he bought some land and began farming. “I had to get a real job to support my farming habits,” Layne says. “I became a technologist in the oil and gas industry; and I got my pilot’s license.” That enabled him to fly crop-dusting planes and, after the oil industry job took him to Calgary and Fort St. John, to commute back to his farm. Eventually, small-scale farming became uneconomic and he sold his farm, happily into a rising market for agricultural real estate. The search for a lifestyle change led them back to Layne’s first love, agriculture. “I have always loved the art of wine, ever since I was 15 years old. I like to read. I would read encyclopedias as a kid. I wouldn’t pick up a novel. I would pick up a manual. Or I would pick up a book of soils, or how to grow … and I would read those.” Winegrowing was farming, after all, and if done right, one can earn a living. They spent about two years looking for a winery. While the search included the Okanagan, they were drawn to Vancouver Island and the lifestyle there. The real estate listing for 40 Knots caught Layne’s eye because 40 knots is also the stall speed of his personal aircraft. He takes advantage of the location to practice an unusual cellar technique: he floods the barrel cellar regularly with salt air. This maintains good humidity for the barrels and may well have subtle positive impact on the aging of the red wines. The consulting winemaker for 40 Knots is Matt Dumayne (below), the New Zealand-trained winemaker at Okanagan Crush Pad Winery in Summerland. “We had thrown everything into this [winery] and decided we had better get the best winemaker we can, because we didn’t know what we were doing,” Layne says. While they have an ongoing relationship with Matt, it is obvious that the consultant is training Layne, and that Layne is an able student. “The second time he was up here, Matt said ‘I am going to turn that fellow into a winemaker’,” Brenda says. The 40 Knots wines are made both from their own grapes (or grapes from elsewhere on Vancouver Island) and from grapes purchased from the Okanagan. They distinguish the wines made from Okanagan fruit with a label, Stall Speed. The portfolio spans the range from sparkling wine and table wine to fortified and dessert wines. Spindrift Brut 2014 ($36.90) is a bottle-fermented blend of Pinot Noir and Chardonnay. The wine is crisp and fresh and provides a display of active bubbles. 90. The flagship white is Whitecaps 2015 ($18.90), a blend of five estate grown grapes – primarily Pinot Gris, Siegerrebe and Auxerrois with a touch of Chardonnay and Pinot Noir. It is a delicious aromatic white with spicy aromas, flavours of lime and guava, a juicy texture and a long, long finish. 91. The winery’s excellent Pinot Gris and Siegerrebe wines are sold out; and there are limited quantities of Viognier and Ortega. The reds include a Gamay Noir 2015, a flavour-packed wine that I scored 91. Of course, it is now sold out. However, the Pinot Noir 2015 ($25.90) also scored 91 and is still available. So is the winery’s Stall Speed Stick Shaker Syrah 2015 ($42.90), a bold and meaty red made with grapes from the south Okanagan. 40 Knots has two wines of special interest. L’Orange Schönburger 2015 ($42.90) is sold out but was the sensation of the tasting room. Matt Dumayne, who also makes so-called orange wine at Okanagan Crush Pad, fermented and aged Schönburger grapes on the skins for some months. The wine, which gets minimal intervention, develops an orange colour and dramatic aromas and flavours. Did I say the wine is complex? It pairs well with both chocolate and cheese – and probably also with a good cigar. The other special wine is Trie Emily 2015 ($89.90), a dessert wine reminiscent of Sauternes. Late harvest Pinot Gris, affected by botrytis, was picked and then put into a drying cabinet f0r 46 days to concentrate the sugars and flavours. The juice was pressed at about 38 Brix, fermented slowly until about half the natural sugar had been turned into 10.6% alcohol. Only 179 bottles were made. I think this is a superb dessert wine (93 points), with honeyed aromas and luscious tropical fruit flavours. The wine is named for a close friend of the 40 Knots owners who helped pick the grapes. Few Similkameen wineries have changed as dramatically in a few years as Corcelettes Estate Winery. The winery opened in 2013 on a three-acre vineyard (with three white varieties) near Cawston. It was launched by the Baessler family, who are originally from Switzerland. Their son, Charlie, who had gained experience in the vineyard and cellars at Burrowing Owl Estate Winery, became the winemaker at Corcelettes. The wines were excellent but there was not enough of them. The Baessler family’s fortunes looked up in early 2015 when, with silent partners, they acquired the shuttered Herder Winery & Vineyards near Keremeos. “I have always had my eye on that place since I worked there,” Charlie told me last year. “It is such a beautiful place.” Charlie’s first winery job in 2008 involved vineyard and cellar work with Lawrence Herder, then one of the winery’s owners. By the spring of 2015, Corcelettes moved its tasting room and wine production to the larger Herder facility. The 6 ½-acre Herder vineyard, while it needed some resuscitation, provided Corcelettes with a number of additional varieties. This spring, another three acres of vines were planted, including more Syrah. The flagship red blend at Corcelettes is called Menhir (the name of tall standing stones in Switzerland). The wine is a blend of almost equal proportions of Syrah and Cabernet Sauvignon. The wine usually is sold out by early October because, with the limited tonnage of grapes available, production has been small. The first vintage in 2011 was just 80 cases. The 2014 vintage, which is almost sold out, was 205 cases. Charlie should be able to increase this, if only modestly, in subsequent releases. The Herder purchase also gave him access to Pinot Noir, including some 14-year-old vines planted by the owner who sold the property to Herder in 2007. Charlie made a light and fruity 2015 Pinot Noir. As well, with Herder wine still inventory at the time of the Corcelettes purchase, he produced a reserve Pinot Noir. In the future, Charlie will continue to make both styles of Pinot Noir. The Herder inventory included mature Bordeaux varietals that had aged gracefully for up to two years on oak, thanks to Lawrence Herder’s decision several years earlier to install large French oak vats. These do not add oak as aggressively as smaller barrels do. Corcelettes has released both a Meritage and Merlot/Cabernet blend, as well as a Merlot from that inventory. It lays out a road map for future additions to the Corcelettes range made by Charlie. The other new wine in the portfolio is a sparkling wine called Santé. The first release was built with some Herder whites that had been resting on the lees. 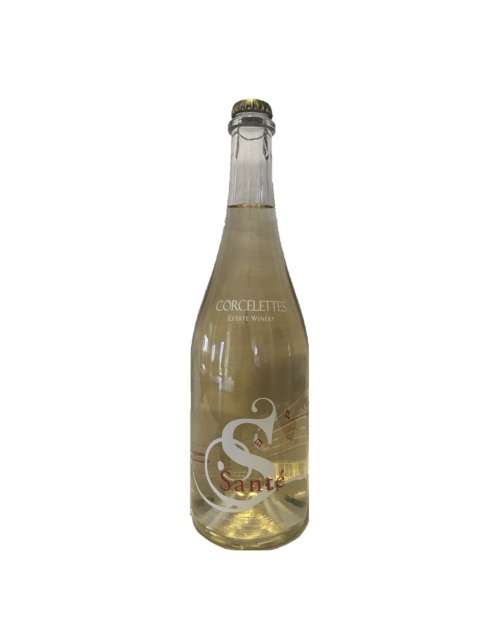 Future offerings of Santé may be different blends but sparkling wine now has a permanent place in the Corcelettes portfolio. Corcelettes Trivium 2014 ($19.90 for 370 cases). This is a blend of 50% Chasselas and 25 each of Pinot Gris and Gewürztraminer. The winemaker says it is intended as an “easy sipper” and it certainly succeeds, with a spicy aroma and flavours of apples, melons and pears. 90. Corcelettes Chasselas 2014 ($24.90 for 45 cases; sold out). This is a crisply dry wine with intense aromas and favours of apples, green melons and pears. 91. Corcelettes Gewürztraminer 2014 ($17.90 for 230 cases). Charlie made this wine with grapes from the same vineyard – but he picked one lot three weeks later than the other. The work allowed him to build a wine with layers of luscious fruit and flavours of spice and grapefruit. The acidity from the early pick preserves the freshness of the wine. 90. 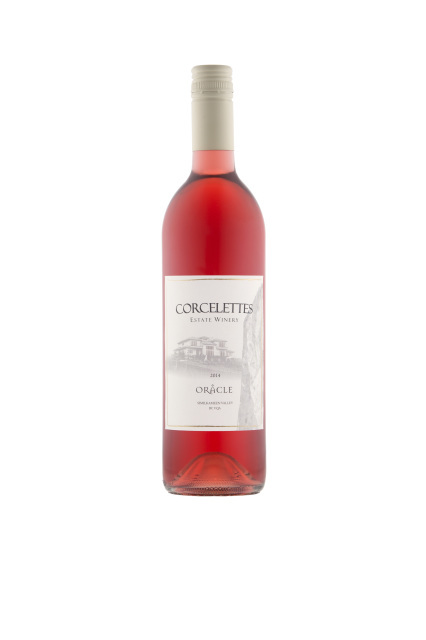 Corcelettes Oråcle Rosé 2015 ($23.90 for 205 cases). This is made with Zweigelt grapes; it needed just six hours of skin contact for adequate colour and flavour extraction. The wine begins with a hint of raspberry mingled with pepper on the nose, leading to flavours of pomegranate and rhubarb. 90. 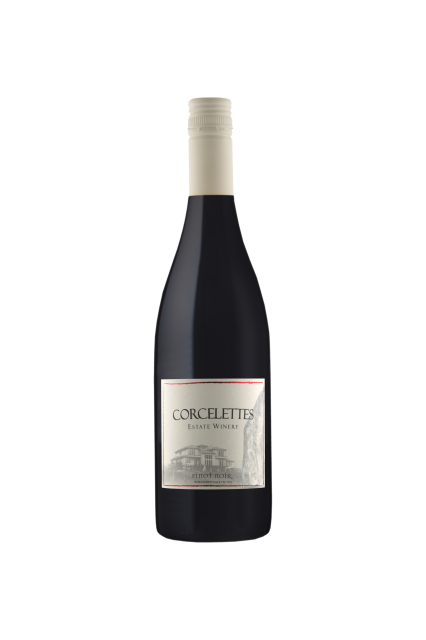 Corcelettes Pinot Noir 2015 ($24.90). This is a “nouveau” style, which is to say juicy and easy to drink. The are aromas and flavours of spicy cherries with a hint of oak and chocolate on the finish. 90. Corcelettes Pinot Noir Reserve 2011 ($27.90). This wine spent 24 months on oak. It has spicy cherry aromas and flavours, with ample barnyard/forest floor aromas and flavours. 89. 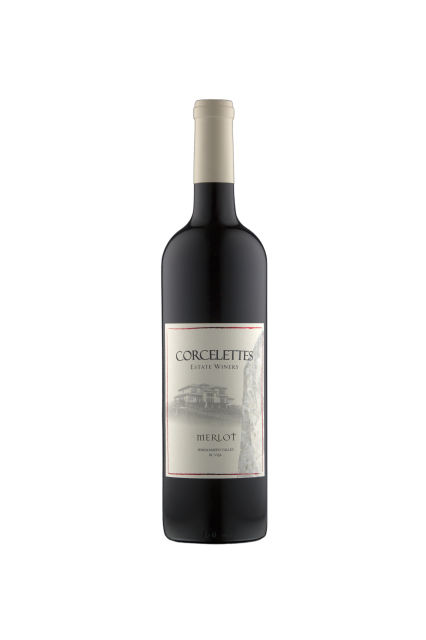 Corcelettes Merlot 2012 ($27.90). Aged in an oak vat, this wine has aromas and flavours of black currants. This is a note of black coffee on the savoury and dusty finish. 88. Corcelettes Menhir 2014 ($31.90 for 205 cases). The blend is 62% Cabernet Sauvignon and 38% Syrah. This complex and satisfying wine is almost sold out. It has aromas of blueberries and plums. On the palate, there are flavours of plum, black cherry and black coffee with herbs and black pepper on the finish. 91. 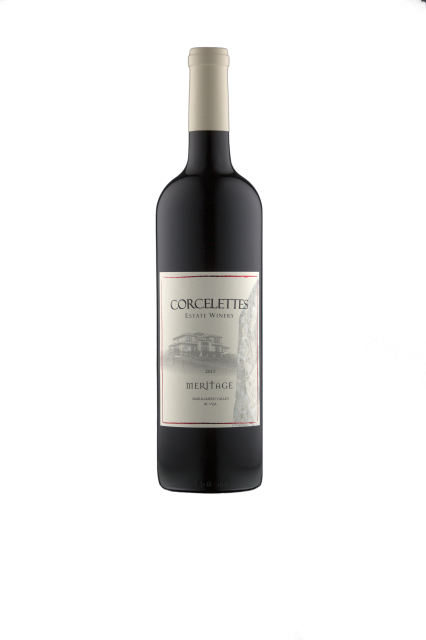 Corcelettes Meritage 2011 ($39.90 for 275 cases). This is 40% Merlot, 25% Cabernet Sauvignon, 25% Cabernet Franc, 6% Malbec and 4% Petit Verdot. The wine was aged 24 months in French oak vats. It has ar0mas and flavours of black currant. In addition, there are flavours of black cherry, chocolate and leather with a note of spice and cedar on the finish. 90. CedarCreek latest release of four reds was accompanied by a note from the new winemaker, Taylor Whelan. Darryl Brooker, who would normally take credit for these wines, moved in 2015 to become the head winemaker at Mission Hill Family Winery. Mission Hill and CedarCreek now have common ownership, as is explained on the CedarCreek website. I have reproduced the back story below. But I think we can give Taylor a lot of credit for these four wines. He was recruited to CedarCreek in 2012, to become assistant winemaker. Purchased in 1986, CedarCreek released its first wines in 1987 and was one of the first 8 pioneering wineries of BC. With four generations of agricultural heritage and more than a quarter century of experience, we have pursued perfection and produced some of the valley's best wines resulting in CedarCreek being twice recognized as "Canada's Winery of the Year". Today, we look proudly towards the future to further promote our region. The story of CedarCreek is rooted in the vision of Senator Ross Fitzpatrick. Born and raised in the Okanagan, he worked his way through university in the orchards and fruit packing houses that dotted this beautiful valley. Although education and a business career led him away from the Okanagan, the dreams of what the fertile soil and climate of the valley could do were never washed from his soul. Years later his success in business afforded him the opportunity to fulfill his boyhood dreams by acquiring an orchard and small vineyard near Kelowna. In 1988, just as he clenched his first fistful of soil from his farm, the small wine industry in the Okanagan was in danger of disappearing with the introduction of the North American Free Trade Agreement. But in Ross Fitzpatrick's mind this uncertainty presented the challenge to begin the renaissance of our grape and wine industry. At CedarCreek the hybrid grapes gave way to new plantings of vinifera vines, the small basement cellar was transformed into state of the art winemaking facilities and the very best in viticulture was applied. This pioneering was tempered by patience and perseverance which became his mantra. These ideals matured into CedarCreek's philosophy: "Respect the land, honour tradition, pursue perfection." In February of 2014 the Fitzpatrick family announced the transfer of ownership of CedarCreek Estate Winery to the von Mandl Family. With this, two of the region’s pioneering winemaking families have come together with a shared vision for the Okanagan Valley, one that will continue the Fitzpatrick family legacy for generations to come. Our knowledge of the terroir of the Okanagan and dedication to the craft have brought many awards and international acclaim, to our winery and our region. We are committed to building on our success by continuing to refine our approach to wine growing. CedarCreek Syrah 2014 ($22.99 for 707 cases). This is the first Syrah from the winery’s Haynes Creek vineyard near Osoyoos. The blend is actually 86% Syrah, 8% Malbec, 3% Viognier, 2% Merlot and 1% Cabernet Franc. The Malbec seems to have added a suggestion of violets and blueberries to the aroma, along with the Syrah’s black cherry and plum. The wine is firm on the palate with dark fruit flavours, punctuated with a touch of black pepper on the finish. The polished texture reflects the 15 months the wine aged in oak. 90. CedarCreek Platinum Desert Ridge Merlot 2013 ($37.99 for 540 cases). This 98% Merlot and 2% Cabernet Sauvignon. Richly dark in colour, it has aromas of cassis with a suggestion of spice. On the palate, it is full-bodied with exemplary concentration of fruit. It has flavours of black currant and black cherry with a finish mingling oak and black olives. The wine was aged in French oak for 22 months. The long ripe tannins add to the elegance of the wine. 92. CedarCreek Platinum Desert Ridge Meritage 2013 ($40.49 for 560 cases). This is 58% Cabernet, 22% Cabernet Franc, 14% Merlot and 6% Malbec. The wine was aged 22 months in French oak. The wine begins with aromas of spicy dark fruit (the winery calls it fruitcake). On the palate, the wine is firm with flavours of cassis and cedar mingled with hints of tobacco and espresso. For immediate drinking, decanting is recommended. However, the wine has the bones to improve with age over the next decade. 93. CedarCreek Desert Ridge Meritage 2014 Amphora Project ($60.99 for 410 bottles). This is 54% Cabernet Sauvignon, 33% Cabernet Franc and 11% Malbec. The grapes were picked, destemmed and about 500 kg went into an amphora, with no additions of sulphur or acid, and left to ferment with wild yeast. The amphora was sealed and left alone for nine months. Then the grapes were pressed by stomping them by foot. The wine spent another eight weeks in a small stainless steel tank. The wine was then bottle unfined and unfiltered. The result is a fleshy, chewy wine with cherry aromas and with flavours of cherry and chocolate. The finish is bitter and, with 14.9% alcohol, a touch hot. I am not scoring this unusual wine because, frankly, I did not like it. But every wine has its champion. Even at $61 plus tax, the wine – released July 1 – is now sold out. This fall’s release of red wines includes many from the 2014 vintage. In my view, these are the best B.C. reds since 2009 – and that is not to dismiss the superbly balanced 2012s. She suggests that her 2014 Reserve Pinot Noir “is the most powerful and elegant Pinot I have ever made.” In fact, both the reserve and the regular Pinot Noirs are arguably the best I can remember tasting from this winery. The other two releases are a 2014 Gamay and a 2014 PTG (Pass-Tous-Grains), a blend of Gamay and Pinot Noir in the tradition of Burgundy. Virtually every B.C. winery is has become serious about Pinot Noir. JoieFarm (and several other producers in the Okanagan and Similkameen) also have embraced Gamay Noir, a variety that once struggled to survive in Burgundy. The story is told well in Wine Grapes, the excellent 1,242-page tome by Jancis Robinson, Julia Harding and José Vouillamoz. “Gamay Noir is a very old Burgundian variety whose name first appeared in an official ban promulgated by Duc Philippe le Hardi in Dijon on 31 July 1395,” they write. I am inclined to think that Beaujolais producers damage the reputation of Gamay each year by making Beaujolais Nouveau. It is hard to take the wine seriously. And it is hard to believe that it leads anyone to taste Morgon or Fleurie, or any of the other Beaujolais crus. These are complex wines from good vineyards. JoieFarm’s Gamay Noir certainly is a match for Beaujolais Villages wines and, in great years like 2014, rises to a Beaujolais cru level. I don’t think anyone consuming it is likely to suffer disease – at least not related to wine. How the grapes are vinified indicates how seriously JoieFarm takes this variety. The grapes are picked by hand. A sorting table is used to make a selection of the best berries. A portion of the grapes are fermented in small 500 litre open top fermenters. The wines are deliberately fermented in small batches. This allows the winemaker to used several yeast strains, to handle the wine gently and to control temperatures, all in aid of preserving freshness of flavour. The wine was aged for 10 months in French oak – a mix of barriques, puncheons and one 30 hectolitre cask. That is a remarkable amount of detailed attention for a $26 wine. JoieFarm Gamay 2014 ($26 for 400 cases). The grapes come from Deep Roots Vineyard. The wine begins with aromas of cherries and plums with a toasty hint from the oak. On the palate, it is a juicy wine packed with cherry flavours, with a note of sage and pepper on the finish. 90. JoieFarm PTG 2014 ($26 for 792 cases). This is 60% Pinot Noir and 40% Gamay Noir. The Pinot Noir grapes are from two Naramata vineyards and one Penticton while the Gamay again is from Deep Roots (which also makes a fine Gamay Noir at its own winery). The winemaking and barrel treatment was similar to the Gamay. The wine begins with spicy aromas of cherry and raspberry. The red fruit is echoed on the palate, along with plum. The wine is juicy and has good weight, with a backbone of ripe tannins. 90. JoieFarm Pinot Noir 2014 ($26 for 507 cases). The winemaker has combined four clones of Pinot Noir from four vineyards to make a wine with power. It has a deep colour, with dramatic forest floor aromas mixed with cherry and spice. The wine is bold on the palate, with flavours of plum and cherry. Decant this wine to unlock all the flavours. 91. JoieFarm “En Famille” Reserve Pinot Noir 2014 ($40 for 299 cases). The winery says this is a selection of the 12 best barrels. The wine is dark, signaling its intensity and concentration. It begins with aromas of raspberry and cherry with spice and toasty oak. This is echoed on the palate, along with a hint of vanilla. The firm tannins suggest potential to age. The winery says it will “age gracefully” for at least five to seven years. 93.